The race will take between 6 hours and 9 hours depending on your rate of travel (the average team takes 7 to 8 hrs). Teams travel together throughout the race course. Your team will carry a passport that you will have stamped at each checkpoint. Only maps supplied by race organizers are allowed. 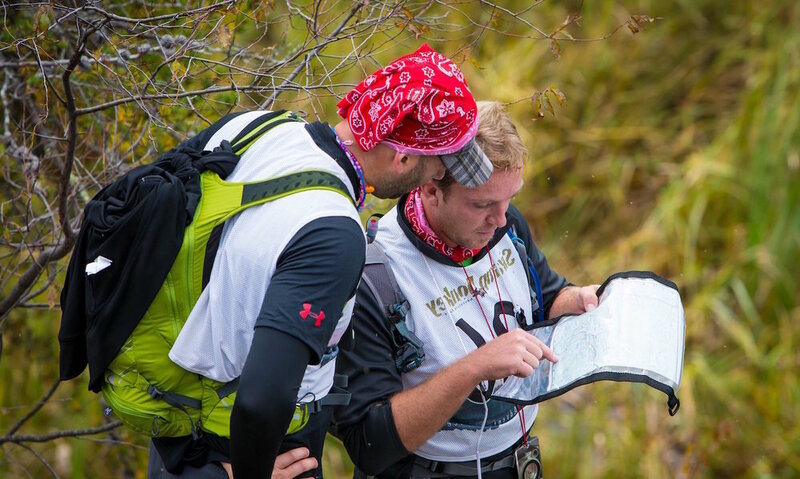 You will receive a topographical map & may also receive more detailed maps of one or more sections of the race. Knowledge of how to take a bearing with a compass and plot a 6 digit UTM is mandatory. You will also receive a set of written instructions to aid you in getting from one CP (Checkpoint) to the next. Please refer to them often! Your feet will get wet - oh, and muddy... Most teams leave on their wet shoes and socks for the entire race. The trekking may be on trails, off trails, through bush, on roads or on side roads. Biking terrain can include roads, secondary roads, fire service roads, double track trails and single track trails. The biking portion can range from easy to intermediate to quite technical. Depending on your skill, some sections may be better walked with your bike. Wearing a helmet is mandatory on all biking portions. Through out the race course you will be given instructions to complete ALL FOUR ELEMENT special tasks. No special skills will be required but FEAR will be present.